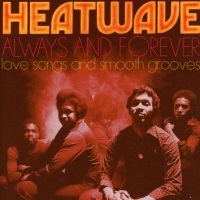 Heatwave was formed in the early 70s by a group of U.S. servicemen stationed in Germany. The band went though various changes in personnel and finally settled in England as a septet featuring vocalist brothers Johnny and Keith Wilder and keyboardist/songwriter Rod Temperton. It became the first true international dance group, with members from the U.S, England, Czechoslovakia and Spain . Keith Wilder re-formed Heatwave with some old and some new members in the early 90s, and the group has toured regularly, also recording a 1997 disc, Live and the Greek Theater, a mostly live rehashing of their hits but which also included a couple decent new studio tracks. Heatwave, in various compositions (but always with Keith Wilder up front), continues to appear, summer after summer, in multi-act disco shows with such artists as the Village People, Gloria Gaynor and KC and the Sunshine band. They are still a welcome sound to hear as we enter 2012.